If you are looking for a beautifully illustrated and fun loving book that makes you think twice about moaning and groaning The Negatees by Adam Wallace is the book for you. This is a beautifully presented paper back book that invited in the first instance. The cover is quirky with the pages on the inside offering a soft textual experience that sits nicely with the theme of the story. I love the moral of this story.....A negative attitude creates negativity where everything seems to go wrong yet a positive attitude creates a life of happiness and positivity. Who wouldn’t want their child to be given this message and be empowered to make a change to their life for the better. This is the first Adam Wallace story I have read, or even seen. I was very impressed with the professionalism of the finished book and the creation of a product that is sure to leave an impression in the minds of children and their carers. It has left me wanting to further explore the literary world of Adam Wallace. If I had to really pick this book to pieces I would have to say that it could be tightened a little in places as some sentences were a little rough and in times it was a little lengthy. Overall it is an enjoyable book that adds fun, laughter and a good feeling to a message that promotes positivity in little people who will be empowered to make changes within themselves that they will pass on to others. The overall effect can only be that of positive empowerment for all. Well done Adam Wallace and illustrator Heath McKenzie. The teaming of the two work well together as they compliment each other, showing a like mindedness and goal of capturing the heart and minds of children. 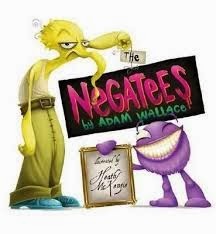 I recommend The Negatees by Adam Wallace to anyone looking for a feel good story with a positive message. This is a book that opens the mind, stimulating the thought processes and turning the frown upside down.